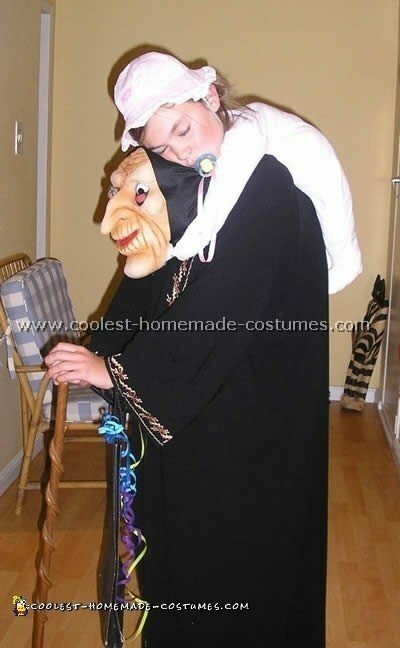 This Piggy Back illusion costume was very easy to make, cheap and looks great. My daughter always has these funny Halloween costume ideas. She put on a backpack stuffed with newspaper (for the hunchback). Then she put on a loose black dress. I stuffed the witch’s mask with newspaper, put a goggle eye and a crystal (ran out of goggle eyes!) in the eye sockets and pinned it to the chest of the dress. Next I stuffed a Babygro (all in one baby suit with poppers) with newspaper and tied the neck of the Babygrow around my daughter’s neck. The arms were tied under the chin of the mask. A baby hat, dummy (pacifier), a walking stick, rosy cheeks and lots of safety pins to pin the baby body to the dress was all that was needed to complete this great optical illusion. My daughter practiced in front of the mirror to make it look more realistic. 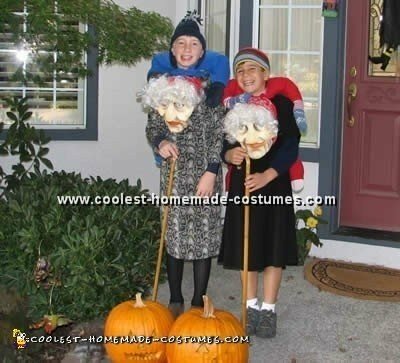 This is the second year in a row that the boys came up with optical illusion funny Halloween costume ideas. I purchased the granny mask from an internet store and filled it with a nylon stuffed with poly fill I hot glue gunned goggle eyes on the mask to fill the eye-holes. I sewed the mask onto the top of a dress I purchased at Goodwill. For the baby illusion I borrowed a 24 month baby sleeper and sewed on some baby mittens to the hands and filled the outfit with poly fill stuffing. Have the person wear a black shirt. Put on a small backpack (to give the illusion of a hump on the old lady) it can be stuffed if you feel you need more of a hump. Put dress on person over the backpack. Unzip baby sleeper down to the legs (this allows you to eventually snap the sleeper around person’s neck) and place it on the back of the lady. Pin or sew the sleeper hands and the feet of the baby to the old lady’s dress. Snap the sleeper’s top around the person’s neck. Add any additional accessories: Cane, purse, old lady shoes, pacifier, baby hat or bonnet or bottle. 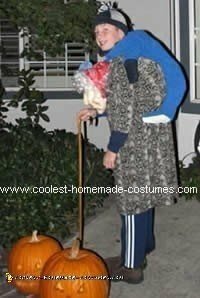 I hope you enjoy our funny Halloween costume ideas.